Oregon is at the forefront of a growing movement in the U.S. to construct more commercial and multifamily buildings with engineered wood products such as cross-laminated timber (CLT). CLT is made by layering pieces of dimension lumber in alternating directions and bonding them together into massive panels several layers thick. CLT panels can be as large as 65 feet by 20 feet, and are strong enough to replace concrete and steel in mid-rise and even high-rise buildings. D.R. Johnson Wood Innovations, located in Riddle, Ore., was the first mill in the U.S. to manufacture structural CLT panels certified for use in construction. A growing number of public and private CLT building projects in the state are in design, under construction or have been completed, including several using panels manufactured by D.R. Johnson. 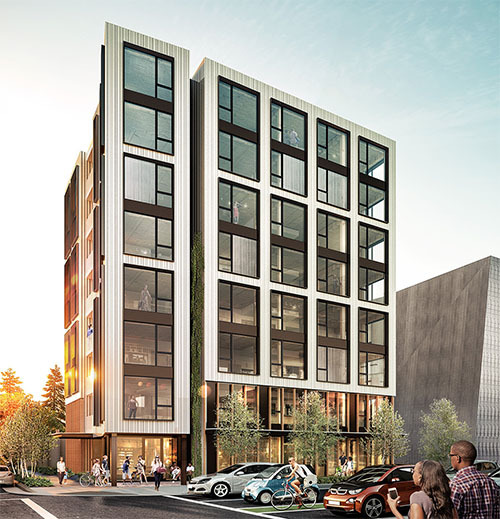 One such project, Framework, is slated to be built in Portland’s Pearl District. The 12-story CLT building was awarded a $1.5 million prize through the U.S. Tall Wood Building Prize Competition, funded by the U.S. Department of Agriculture, the Softwood Lumber Board and the Binational Softwood Lumber Council. The prize money was used to conduct seismic and fire-safety testing of the project’s unique engineering system. The Framework project is being designed and developed by Portland-based firms LEVER Architecture and project^. When completed in 2018, it will be the tallest wood building in the United States. By opening up the potential to build more commercial and multifamily buildings with a locally grown, renewable resource, the mass timber construction movement may help create more wood-products manufacturing jobs in struggling rural communities. Traditionally, the wood products industry has been dependent on single-family home construction. But more multifamily housing units are being constructed, and encouraging these to be built with domestically produced wood could have a big impact on the industry and the rural areas where mills are located. Federal and state initiatives supporting rural jobs have focused on increasing the use of wood in commercial construction.Early-stage funding (through the state-funded nonprofit Oregon BEST) for research at Oregon State University helped D.R. Johnson start manufacturing CLT. In 2016, the Oregon company announced it was adding staff to keep up with the high demand for the advanced wood product. Officials with the state of Oregon have shown a keen interest in ramping up manufacturing of advanced wood products to support the state’s rural timber towns. The governor’s office, through Business Oregon and other state agencies, actively supports the development of advanced wood products markets and manufacturing. And the Oregon Building Codes Division has been instrumental in getting permits issued for mass timber buildings constructed with advanced wood products.